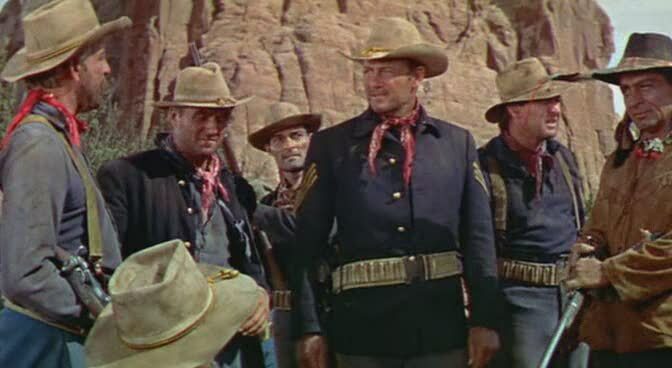 Joel McCrea, one of the actors most associated with fifties westerns, plays Sergeant Vinson, a flawed character that seems to be an echo of John Wayne from The Searchers. McCrea's Sergeant is driven by a prejudice that was born from the anger, fear, and helplessness of a past tragedy. Seemingly surrounded by Apache, he's faced with a series of bad circumstances, but he continues to make questionable decisions that cause his men to doubt his leadership ability. The rest of the cast is made up of a bunch of recognizable character actors of the day, including Forrest Tucker from F Troop, John Russell from Rio Bravo and Pale Rider, Denver Pyle from The Dukes of Hazzard,Susan Cabot from The Wasp Woman, and Anthony Caruso from The Asphalt Jungle. 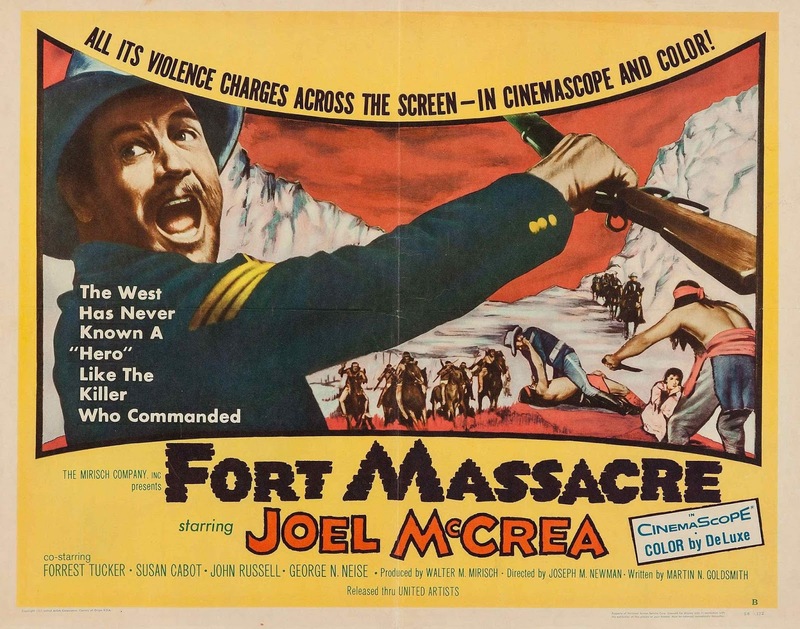 Like a lot of fifties westerns, Fort Massacre is steeped in film noir tradition. The script was written by Martin Goldsmith, the screenwriter of the outstanding noir Detour, as well as another western from this era, Cast a Long Shadow, which starred real-life war hero Audie Murphy. His dialogue is as sharp as a knife (or an arrow?). When a character questions one of McCrea's decisions, the Sergeant refers to his rank, saying "You want these stripes? You can have 'em. They weigh a ton." The men of C Troop hold no illusions or romance about their status in the Cavalry, and pass their time grumbling about their position, aware that they're faceless troops who are only meant to follow orders without question. This means that no one will really mourn them if they're sent straight to their graves, which seems more likely all the time. It's a cold and realistic look at regimented life in the service of something claiming to be noble. The movie was shot in Arizona, New Mexico, and Utah, using real landmarks like Church Rock and what appears to be the remains of an actual adobe village. While undeniably beautiful, the gray skies and brown scrub brush help to provide a sense of hopelessness and isolation that mirrors the plight of C Troop. The red and gold sunsets and mountains associated with the mythical west are nowhere to be seen here. This is a harsh country, fraught with danger. Hope doesn't live here. This film is also absolutely brutal, a fact that the poster played up with the line "All it's violence charges across the screen--in Cinemascope and color!" They aren't playing around; this movie is incredibly violent. A guy gets an arrow in the neck. There are multiple head shots. When McCrea makes his first kill, it's not with a gun from a distance, but up close and personal, with his bare hands. The body count is high, the blood is red, and the morality is gray. This is the appeal of Fort Massacre. It's a western filled with a lot of noir traditions: bursts of violence, seemingly-hopeless circumstances, and a group of well-defined characters that all have different motivations and aspirations. There are no black hats and white hats, just real people trying--and sometimes failing--to do what they think is right. It's hard to go wrong with any western from this prolific period for the genre, but Fort Massacre is an exceptional example of how even the smaller movies from the time remain compelling, even all these years later. You can check out Fort Massacre here.